Eggplant is a fat free, low-sodium food that is high in fiber. Although treated as a vegetable, eggplant is actually a fruit. A member of the nightshade family, it can be green, white, striped, or purple. A 1 cup serving of raw, cubed eggplant contains a meager 20 calories. An average sized eggplant is about one pound and yields approximately five cups of cubed fruit. 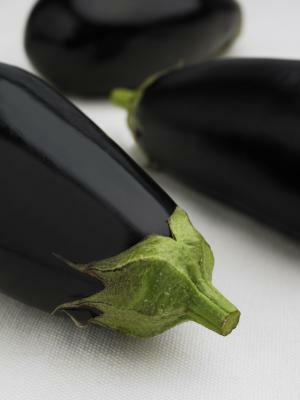 Eggplant is basically fat free, containing less than 1 g of fat and fatty acids in each serving. The American Heart Association recommends roasting low fat foods, such as eggplant, for dietary variety. 1 cup serving of eggplant contains 3 g, or 11 percent of the recommended daily amount of fiber. The American Dietetic Association states that fiber intake can protect against heart disease and advises that most fiber come from plant foods and not supplements. Eggplant contains 5 percent of the daily requirement of potassium. The American Dietetic Association states that research has shown that potassium may help the body lower blood pressure, which in turn can help prevent cardiovascular disease. A serving of eggplant contains 10 percent of the recommended daily amount of manganese and 3 percent of the amounts of magnesium and copper. Each of eggplant contains 2 g of sugar; certainly not enough to outweigh the other health benefits of this fruit, but something to keep in mind when planning a balanced diet.